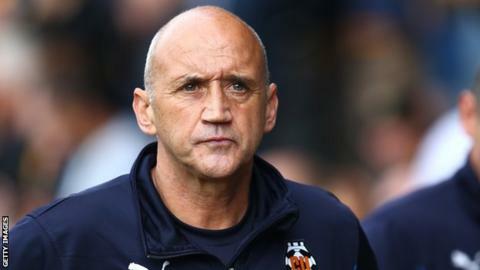 Cambridge United manager Richard Money feels his League Two side are going through "a challenging time". Money's team are 13th and have been beset by injuries this season, with eight first-teamers set to miss Saturday's game against Stevenage. "We absolutely do not feel that we have started yet. We've had some periods of good play but it's been stop-go for too many players," said Money. "Therefore selection's been difficult to be consistent with." Cambridge United have not beaten Stevenage - their closest geographical rivals in League Two - in their last four matches, losing three and drawing one. Money said earlier this month said just three members of his squad had not missed training or a match. He continued to BBC Radio Cambridgeshire: "We're still three points off fifth place after eight games, so you can take that as a positive as much as a negative. "We can't keep saying we haven't started yet, we need to start, and we can't wait and rely on people getting fit. It's up to the group of players and staff together to make sure we're moving in the right direction." The U's, whose injury list includes winger Ryan Donaldson, midfielder Keith Keane and goalkeeper Chris Dunn, host a Stevenage side who are yet to win away under Teddy Sheringham. Boro are currently 18th in the table under the former England striker, in his first managerial role, and Money says the story of both sides' seasons so far follow a similar pattern. "If you look at their early season results they've been as inconsistent as we have," said Money. "And both teams look as though there's the promise of a lot more but both in a state of transition. "I'm sure Teddy will want to get his own mark on things as quickly as he can. They've still got the majority of last year's group, they're still a formidable outfit."